Have you ever been to a wedding reception that seemed to drag, or seemed chaotic? I draw upon my significant experience as a wedding DJ to make sure your reception flows smoothly. We start by making a great event schedule based on your vision of the day, as well as my expert advice. Then I will communicate important details to your other vendors about items on the schedule that may affect them. For example, the photographer may want to know what time the cake cutting is, or what we will be doing around sunset time. You may have already told the caterer what time to begin dinner, but perhaps I'll need to tell them what time we need them to pour champagne for the toast. These are all details you shouldn't have to worry about once we complete the event schedule. On the big day, I will coordinate the timing of events and I will keep your other vendors informed. 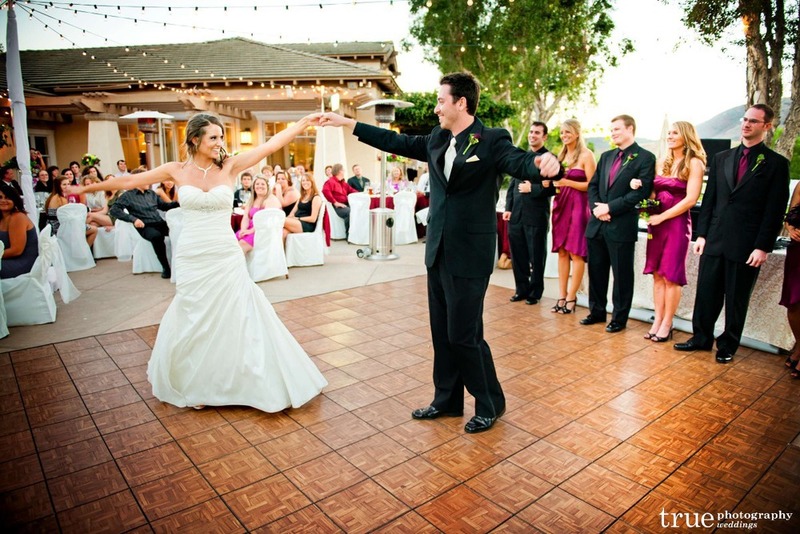 Your photographer will be notified before I start a big event, like the first dance. I will remind the caterer about pouring champagne. My goal is to make sure you enjoy the day with your guests. Trevor and Amanda's first dance. We had the bridal party lined up on the dance floor so they could be in the pictures too. My name is on the contract, you will work with me from day 1, and I will perform at your event personally. I have the benefit of over 15 years of experience as a DJ/Master of Ceremonies. I can provide helpful, creative suggestions as we plan your perfect event. As a professional Master of Ceremonies, it is my job to grab the attention of your guests, then focus their attention where it needs to be. I don't make myself the center of attention, my announcements are clear and engaging. Michelle and George showing off for their first dance. We did the first dance immediately after the grand entrance. I know I keep mentioning the fact that I am the only person in this company. So it begs the question, what happens if I get sick? First of all, I have never missed a wedding due to illness or emergency. But, if some emergency keeps me from your wedding, I co-own a separate company with a staff of 4 DJs. Hiring me means you get the superb services of a veteran company owner, AND the security of working with a company with multiple DJs. If equipment should fail, I have backup equipment with me at all events. It's only me, so please check your date below to see if I am available on your big day. If not, you will be referred to another quality DJ company. To get an accurate quote based on how many hours and the specific services you need, please contact me at (619) 944-5565 or email tim@perfectlyentertaining.com, or fill out this contact form. Vanessa and Len sharing a great moment. As a master of ceremonies, I help create great moments that don't revolve around me.